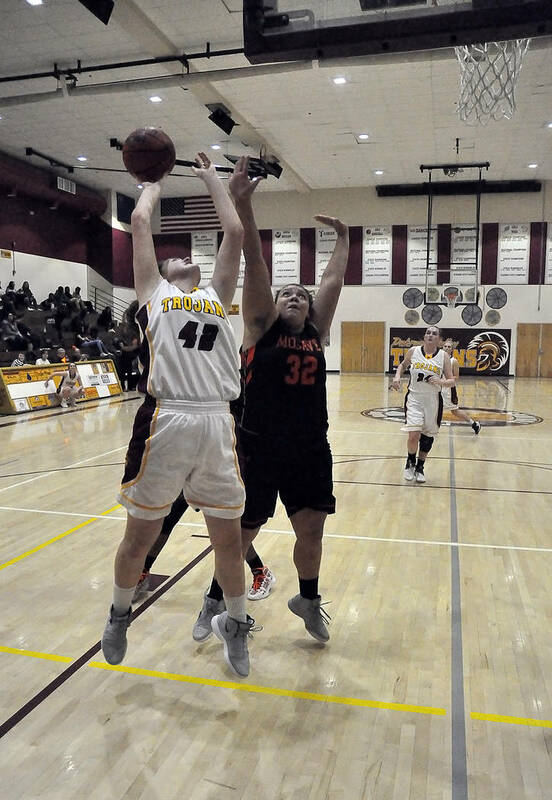 A quick glance at the scores for this season’s Pahrump Valley High School girls basketball team shows they win with defense. 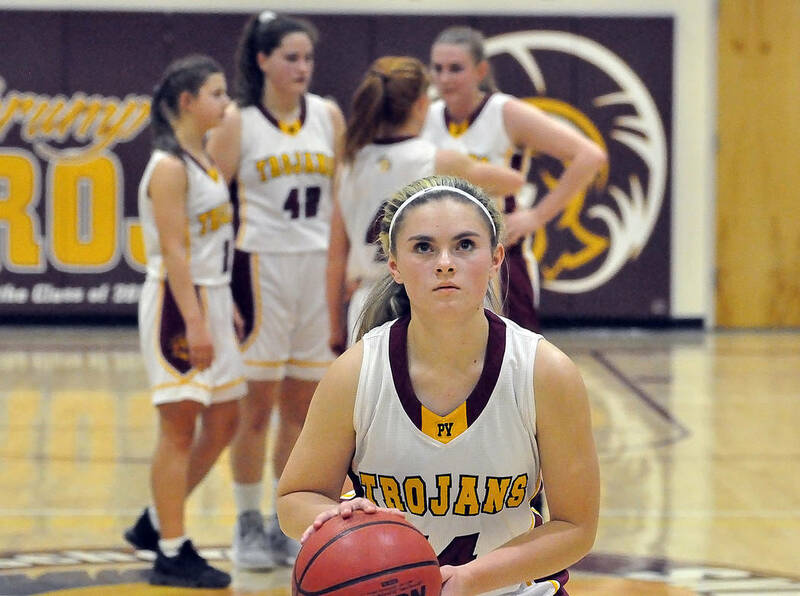 It’s no secret that whatever their challenges might be on the offensive end, the Trojans show up night after night on the defensive end, usually with sterling results. Horace Langford Jr./Pahrump Valley Times Pahrump Valley's Maddie Hansen shoots free throws after a technical foul was called on Mojave's bench during the fourth quarter Tuesday night's game in Pahrump. Horace Langford Jr./Pahrump Valley Times Sophomore forward Kate Daffer goes up for a shot while Mojave junior Jasmine Kaufman defends Tuesday night in Pahrump. Daffer's 9 points led the Trojans in their 31-25 victory. Horace Langford Jr./Pahrump Valley Times Pahrump Valley's Virginia Weir launches a 3-point shot against Mojave during Tuesday night's game in Pahrump. That was certainly the case Tuesday night against Mojave, which came into the game tied with Pahrump Valley for first place in the Sunset League. 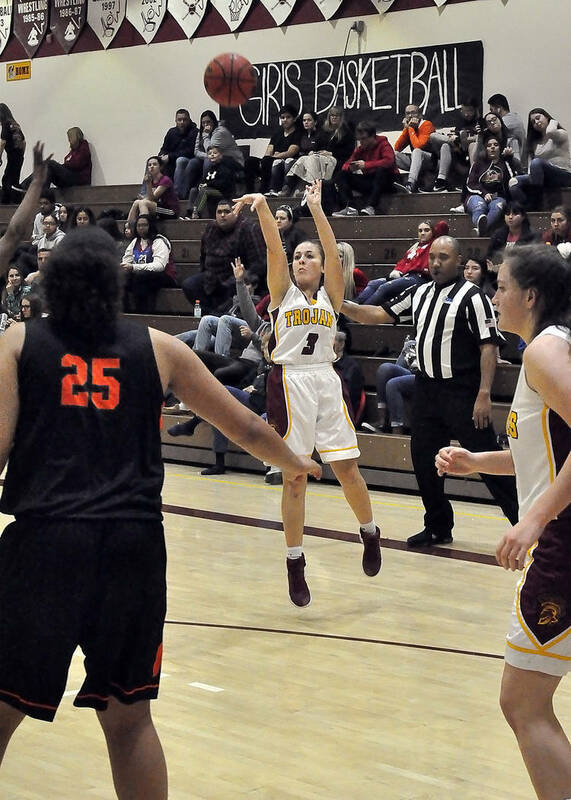 The Rattlers left in second place despite not a single Trojan scoring more than Kate Daffer’s 9 points during a deceptively one-sided 31-25 Pahrump Valley win. The visitors outscored the Trojans 11-5 during the fourth quarter to make it look closer than it was. Hopkins speaks the truth. The Trojans (16-11, 5-0 Sunset) went three minutes without scoring during the second quarter and still had a larger lead when it was over than when it started because Mojave (9-6, 4-1 Sunset) managed just 2 points during the period. It actually looked as if the Trojans would win easily early. Four players scored during the first period, including 3-pointers by Tayla Wombaker and Maddie Hansen, as the Trojans seized a 12-4 lead. They extended that to 18-6 at halftime. They built their biggest lead of the game thanks largely to Daffer. A layup off of an inbound pass and another inside basket off of a nice feed by Makayla Gent made it 22-8, then Daffer found Kylie Stritenberger down low, resulting in a Mojave foul. Stritenberger made the second free throw for a 15-point bulge. The offense went into a deep freeze, as Pahrump Valley managed to score just 8 points over the last quarter and a half. But that ever-present defense kept up its end of the bargain, and the closest the Rattlers got was the final score after a free throw with 19.5 seconds left. “We kept the Kelly girl, their best player, to 6 points,” Hopkins said. Senior guard Alecia Kelly was held scoreless during the first half and managed just two baskets, both during the third quarter. “She got away there a couple of times and hit a couple of 3s, but overall I was pretty happy with that. After a Thursday game against Valley, the girls don’t play again until Feb. 5 at home against Del Sol.